Bernard Storm, President of August Storm GmbH & Co. KG (right), and Dr. Juergen Zeschky, CEO of Hoerbiger Holding AG (left), signed the corresponding agreement on October 20, 2016. August Storm GmbH & Co. KG (Storm) has added Hoerbiger ignition and control systems to its portfolio, increasing its engine-service offerings. Headquartered in Spelle, Germany, Storm is one of the largest European OEM-independent service companies for combustion engines ranging from 134 to 9383 hp (100 to 7000 kW). The company offers maintenance and repair services for engines, drive systems, and compressors. Storm operates in over 15 countries and employs more than 300 people. Storm is now offering Altronic products for all common gas and diesel engines for the European region, including product support and upgrades of existing applications. Altronic, part of Hoerbiger Engine Solutions, manufactures ignition and control systems for industrial engines. 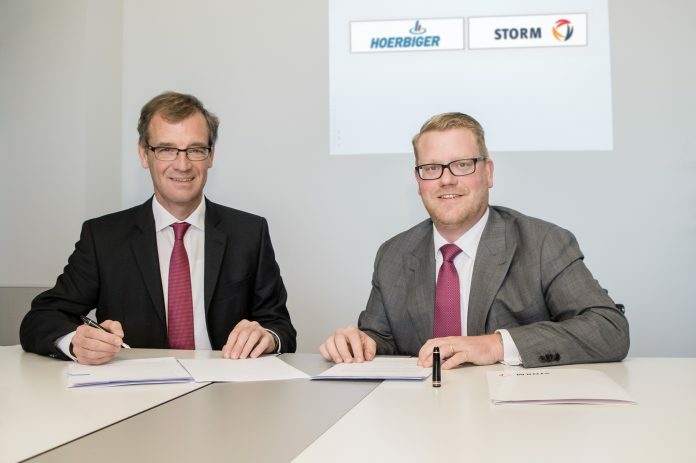 In June 2016, Hoerbiger and Storm entered into a service cooperation agreement for selected major projects. The cooperation covers spare parts management, 24/7 field service, and workshop services to support customers in high equipment availability, engineering services, and equipment upgrade solutions for reciprocating gas compressors and engines.